No longer relying on our pond! We currently use pond water for cleaning and bathing. We have no safe drinking water. We have to haul drinking water in. When the pond goes dry we have to haul water from 20 miles away down dangerous highways as the water moves in the tank while driving causing the truck to swerve. Have received well drilling estimates only to find they are so far out of our range we will never have safe running water without your assistance. We would like to thank everyone at the Water Well Trust with helping us get our new water well. Y’all are wonderful people! Again, thank y’all! I’m super please with everything regarding my well. You. Rodgers. Placement of well. Everyone and everything! God first…who had provided all people and product! We wanted you to know you truly changed our lives with this water loan. Thanks so much! Wendell J. Lee Well Services Inc. It is a great program because it is a low interest loan as opposed to simply a giveaway. This serves as a real motivation. And, it meets the needs of so many, like me, who just need a hand to meet their water needs. It helped me tremendously. Clean well water once again! 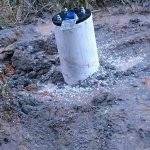 My husband and I are asking for assistance from the WWT to have a well dug for running water. Not having water has been a challenge living our lives day to day with all of our needs,. Not being able to shower, clean, do laundry, cook and drink water does not seem to exist in America but it does. We do know our stress, insecurities, mental and physical well being, hygiene and living will be much better with your help getting a well! I’m a fifty­ five year old man with a young wife and five young children. My family and I purchased forty acres in northern Arkansas in 2009. We made a choice to live on the property even though no one ever had. With no well or water source of any kind on the property, we hauled water with a four wheel drive suburban for over five years. 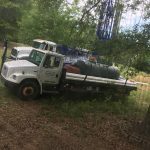 Pulling a trailer carrying a three hundred gallon cage up a quarter mile long steep washed out dirt driveway after an hour and a half round trip drive wasn’t easy nor cheap. The maintenance on the vehicles and trailers alone was hard enough to endure. Foul weather sometimes made “water runs” impossible. We learned about Well Water Trust by chance from a friend that had a flyer she gave us. I had considered selling family heirlooms, taking on another job, asking my wife to do the same, even giving up and selling out. Making the simple phone call to Margaret Martens changed our standards of living and overall well being beyond measure. With absolutely no red tape or delay in qualification, we were able to contract the services and submit invoices with no trouble or out of pocket expenses whatsoever. We literally had running water within thirty days of our initial phone call. This opportunity we were blessed with is nothing shy of a miracle to us. I’m so grateful and thankful to Water Well Trust for giving me a loan to get my well fixed. I truly appreciate y’all being there for me. The staff was so nice and friendly and I will recommend them to anyone in need. Thank you so much. And, may God bless you all. Every night when I go to bed, I thank you and skip and our heavenly father for the water you gave us.